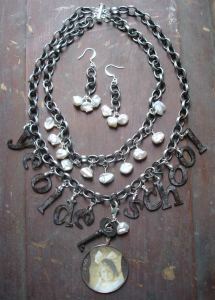 Looking to combine your love of crochet with jewelry?? Heres an easy project to get you started. From Craftypod blog, here is a fun wire crocheted flower pendant tutorial. Easy, quick and fun! From StudioHeath Jewelry, comes this very intensive wire wrapping tutorial for a cage pendant. Once you learn the basics, you could personalize this with various wires, guages and things you ‘cage’ inside! The Bead Shop has this gorgeous and free wire wrapped bead bezel tutorial. Lots of pics make it easy to make and it looks really luxe when done. You be in LOVE with this super easy wire ring tutorial from Cathie & Steve on Creative Juice! Its fun, and you’ll be obssessed making tons of them for all of your friends too. Need inspiration? Check out Beading Daily! Kickin’ it Ye Olde Style! Some people like to kick it old skool style, but Margot Potter likes to kick it ye olde school style!